Sewing Hope offers the first account of a bold challenge to apparel-industry sweatshops. The Alta Gracia factory in the Dominican Republic is the anti-sweatshop. It boasts a living wage three times the legal minimum, high health and safety standards, and a legitimate union—all verified by an independent monitor. It is the only apparel factory in the global south to meet these criteria. The Alta Gracia business model represents an alternative to the industry’s usual race-to-the-bottom model with its inherent poverty wages and unsafe factory conditions. Workers’ stories reveal how adding US$0.90 to a sweatshirt’s production price can change lives: from getting a life-saving operation to a reunited family; from purchasing children's school uniforms to taking night classes; from obtaining first-ever bank loans to installing running water. 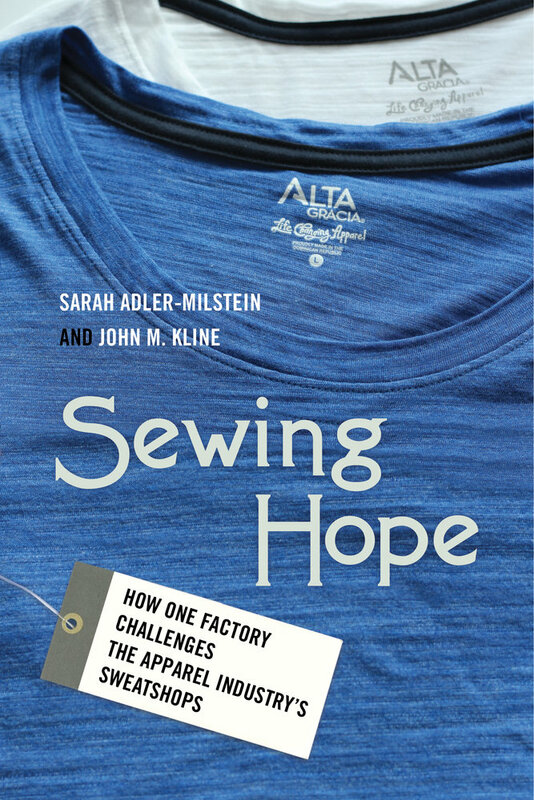 Sewing Hope invites readers into the apparel industry’s sweatshops and the Alta Gracia factory to learn how the anti-sweatshop started, how it overcame challenges, and how the impact of its business model could transform the global industry. Sarah Adler-Milstein is a worker-rights advocate and has served as Field Director for Latin America and the Caribbean for the Worker Rights Consortium. John M. Kline is Professor of International Business Diplomacy at Georgetown University’s School of Foreign Service. He is the author of four books, including the textbook Ethics for International Business. In this episode Dawn Carpenter talks about the idea of an anti-sweatshop, the experience of an inspiring apparel factory in the Dominican Republic that shows the world that is possible and actually good business practice for an apparel factory in the developing world to pay, not only a living wage, but a dignity wage in a work environment that is honorable. John Kline, co-author with Sarah Adler Milstein of Sewing Hope and a leading authority on international business ethics and Adriana Vaez, manager of the Alta Gracia apparel factory, share the amazing opportunity that is given to this Dominican Republic community while creating a profitable business. Listen to this episode and be inspired to become a mindful consumer. First Living Wage Payday. April 16th, 2010.